This book is about mathematics in Sweden between 1630 and 1950—from S. Klingenstierna to M. Riesz, T. Carleman, and A. Beurling. It tells the story of how continental mathematics came to Sweden, how it was received, and how it inspired new results. The book contains a biography of Gösta Mittag-Leffler, the father of Swedish mathematics, who introduced the Weierstrassian theory of analytic functions and dominated a golden age from 1880 to 1910. Important results are analyzed and re-proved in modern notation, with explanations of their relations to mathematics at the time. The book treats Bäcklund transformations, Mittag-Leffler's theorem, the Phragmén-Lindelöf theorem and Carleman's contributions to the spectral theorem, quantum mechanics, and the asymptotics of eigenvalues and eigenfunctions. Other important features include sketches of personalities and university life. Presents the first thorough treatment of mathematics in Sweden. Discusses the work of the great mathematicians and the development of mathematics throughout Europe. Brings the mathematics of an era to life in an informative and highly readable way. Graduate students, research mathematicians, and historians interested in scientific mathematics. The text brings an expert overview of the development of mathematics, presented in a master style that reflects a deep insight into the subject. Thus the readers learn important facts from the history of mathematics and extend their previous knowledge in fields that do not exactly overlap their own specialties. This book on mathematics and mathematicians is strongly recommended to anybody who likes mathematics and its history. 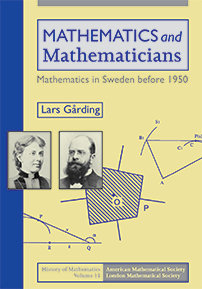 This book is an extremely readable history of mathematics in Sweden up to 1950 … strongly recommended to anybody who likes mathematics and its history. Gives an in-depth look at the mathematical scene in Sweden … This is a book written by a mathematician for mathematicians—besides biographical and historical material, the author devotes much space to the mathematical content involved. He does not hesitate to express his opinions, often with a dry wit.